White to play. Can he win? 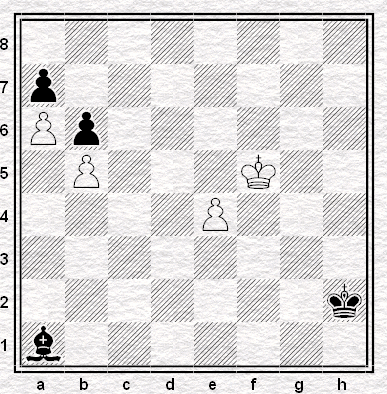 White to play and mate in four moves. That was the chess year that was. Not a good one - not on my side of the board at any rate. the best I've ever had. My club season ended in relegation which I had two clear chances to avoid: one in the last round of the regular season which would have kept my side out of the relegation play-off, one in the play-off itself. On the way I missed yet another chance to beat an International Master. The came the Benasque tournament in which I found myself on 4.5/7 (inept performances against future World Champions notwithstanding) and in the eighth round missed a draw (or better) against a FIDE Master. At the time I was dreaming of a strong finish and a rating approaching 2200: by the time I lost that game and the two that followed it, to sub-2000 opposition, my rating was heading south at a rate that suggested I won't see those points again. (Fortunately my ECF grade is apparently due to go up into the high 180s without my even playing, and frankly, it's just as well.) I played the last round, as it happens, with mild food poisoning - and an earlier round with acute food poisoning, quite the sickest I've ever been at a chess tournament (much worse than the flu I had at the 4NCL, which meant I flew a couple of thousand kilometres in order to play one game of about a dozen moves) which rendered me, though not necessarily my guts, immobile until an hour before play. Still, I won the game. Then there was the provincial championships in which I was once again the highest rated player and once again did nothing to justify it, finishing a very lucky third and clipping a few more points off the aforementioned FIDE rating. It's a long ride from here, all of it on the slidey curve downhill. There was a world championship match, apparently, though you wouldn't have thought to so from the BBC, to whom the game remains practically invisible, stupid pieces about chessboxing aside. Elsewhere in media Ray Keene continues to get away with it - perhaps somebody should try copying chunks of Chess and presenting it as their own work, and then we'd see if Malcolm Pein was still prepared to devote several pages of his magazine to an interview by an acolyte. Still, there was the Olympiad, of which my most outstanding memory is was the close, close call Switzerland had against a Welsh side rated several hundred points a man below them - the Welsh eventually going down 2.5-1.5 when they should have done better. Of course there's nothing like an international sporting competition to encourage stupidity and my second most outstanding memory involves a particularly ignorant loudmouth on the English Chess Forum declaring Dagne Ciuksyte "a traitor to her country" and subsequently writing of Ingrid Lauterbach as if she were something to do with the Wehrmacht. Elsewhere in English chess the Chess Sets for Schools fiasco remains a fiasco even if not everybody who says so is able to refrain from a rather wearying and childish campaign of personal abuse. Not many high points then? Maybe not, though it was certainly entertaining to have an increasingly off-balance Nigel Davies accuse the blog of engaging in a Red conspiracy to undermine the market system by inflating the public's expectations when it comes to chess books. Where Nigel is concerned, my expectations will always be of the highest: and Nigel would probably have won my chess moment of the year for the second year running - were it not for the fact that after the first round of the Benasque tournament, back at the campsite, I found myself making a marriage proposal and having it accepted. I think that might be the moment of the year. Or maybe any other. 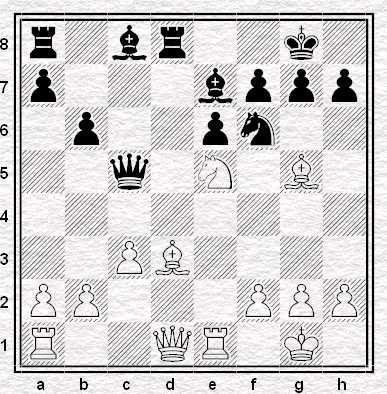 "... White's queen is attacked and it appears that any attempt to save it permits mate. 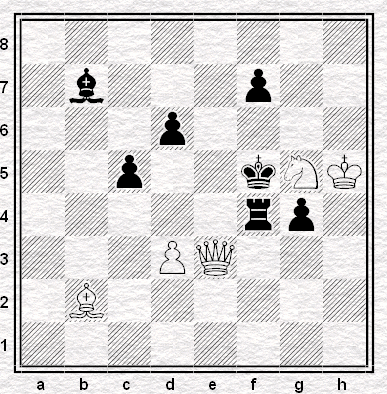 Black might have been excused for anticipating a win rather than a king-trip to the eighth rank." So White looks doomed but in fact it's Black who's going to lose. Given that we know that in advance I don't think it's too tricky to guess what White's starting move must be; the difficult bit is analysing the line out to the end. If you don't fancy calculating the mate you could take a punt at how we get from our second diagram to the first. Anyhoo, although the S&BCC blog will continue to publish every day over the festive period that's it from me for another year. Merry Christmas and a happy new year to you all. See you again in 2009. Hurrah! We've finished 2008 with a bang, with our first team in London League Division One beating Cavendish Seconds 6½ to 4½ with one game still to finish. Not bad considering we defaulted our bottom board, and special mention should go to Gary Smith who effortlessly held board 11 against an opponent graded 39 points higher than he. Now, I'm sure the eagle-eyed amongst you will have noticed the usual 'Club News' has been replaced by 'Local News'. That's in order to congratulate two local players who normally sit opposite the board from us Streatham and Brixton Chess Clubbers: Yang-Fan Zhou of Coulsdon and Surrey, and Rawle Allicock of Beckenham & Charlton and Kent. Because at the latest International Tournament in Coulsdon, each achieved an IM Norm. Something tells me it won't be the last for either. That one's via here, btw. Finally, a note of thanks to our friendly neighbours Streatham Chess Club who on Thursday last week at their venue Streatham Library held a fun and entertaining quiz, that they also invited us to. I'd guess around 40 or 50 people attended, and fun was certainly had by all. The only thing to add is a note to Stan the quiz master, just to say that Darth Vader is not a Jedi. Oh, and here's a question from the quiz for our readers to enjoy. How many tube stops on the London Underground contain the name of a chess piece? And which are they? No looking at a map first now. J Healy V M Lia, Barbican Open - 1980. 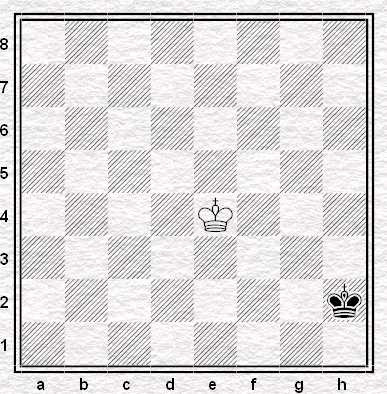 White (to move) is a piece down and threatened with exchange of queens. 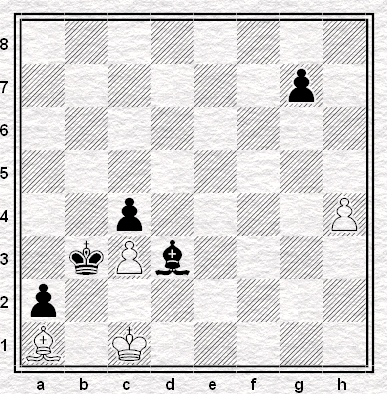 If White moves his queen away, then his knight his doubly attacked by Black's queen and bishop. How, in this seemingly desperate situation, did White turn the tables? More by luck than judgement the last Sunday before Christmas finds us at a series end. Today we have our final puzzle from www.thegrassarena.net. This one, like all the others, started life as Leonard Barden's Evening Standard chess column. So no more chess puzzles but I'm hoping to write a post or two about John Healy's life and chess career in the new year so if anybody has any information about the man himself please do get in touch. 606 puzzles for chess nuts, Wilson and Alberston, Sterling, 2008. So said, EJH in the comments box to the most recent post in this series. True that, I thought when I read it. True for me anyway. A couple of days ago in the comments to a completely different post Will made reference to the GM Ram. If we took that book's concept of essential positions, but switched in our own objective of accumulating the endgame knowledge a chess amateur with limited study time might reasonably be expected to acquire, where would we be? OK, this is really just a 'how long is a piece of string?' question. I know it all depends on your definition of 'chess amateur', 'limited study time' and 'reasonably be expected to acquire' ... but what is your answer? That's what I want to know. As ever, all contributions to the comments box gratefully received. The good player (who realises that clear opportunities should not be missed) will not refrain from proceeding beyond his depth, if he feels that in the depths he may find victory, or better chances than he can find in the shallows. What separates a player of a given class from the player in the class below? What have they got that you haven't? It matters more to know this than to know how a grandmaster plays, because you're not going to be a grandmaster - but everybody would like to add 10-15 points to their playing strength. Of course, if a player is better than you then on the whole they’ll likely do everything just a bit better than you; but I think that at certain points on the scale, much of the difference comes down to one particular area of understanding. Perhaps professionals differ from amateurs, above all else, in endgame ability: grandmasters from master, in their positional understanding. On the level that this article is concerned with, the difference between a player of 170+ and one of 145-165, does not appear to me to be one of calculative ability (I rarely find, in post-mortems, that I've seen more than my lesser graded opponent) but something to do with the confidence to sacrifice. There are, of course, many exceptions to this rule, but in general, when I see games between players in the 'good club player' group, I find them a little - well, stodgy. People can build attacking positions, all right, but they are not always sure what to do with them. It is as if they expect, having played better to date than their opponents, that a clear winning line will present itself without material risk. Which, I'm afraid, it often won't. You have to be prepared to sacrifice. Some readers will object that this is not true, that they sacrifice all the time. Are you sure? Looking through the bulletin [i.e. Disinformator - ejh 2008] you find people sacrificing for mate, and you find people sacrificing when they are in trouble. How often do you see sacrifices, below 170+ class, which are part of the normal development of an attack, but which have no clear outcome? Very rarely. Here is the sort of move I mean. Horton-Westphalen, Oxford and District League 1996. 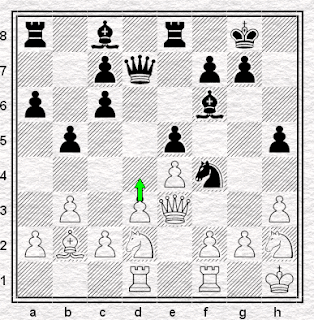 Play continued: 14. h5! 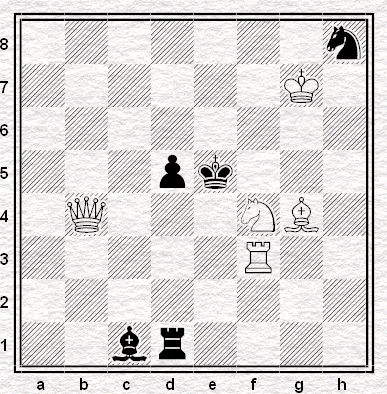 gxh5 (opening up the king: 14. ...g5 loses to 15. Nxg5 fxg5 16. Qxg5+ Kh8 17. Qe5+) 15. Nd4 e6 16. g4! Nd5 17. Nxd5 cxd5, and now 18. Bxd5! would have won, as after 18...exd5 19. Nf5+ and 20. Qh6 forces mate. The most important thing about 16. g4 was that I didn't hedge my bets by playing Bf3 or something similar, trying to keep the attack by recovering the pawn. 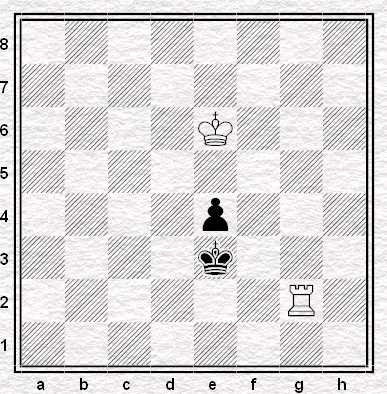 Even g4xh5, which won it back, was not played to win the pawn but to open the g-file. Fischer-Larsen, Portoroz Interzonal 1958. Play continued: 17. h4 Qb5 18. h5! Rfc8 (...gxh5 now or previously is met by g4, as in the previous game. 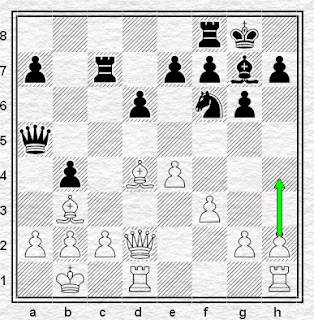 See My Sixty Memorable Games for the variations: not given is 18...Nxh5, which loses to 19. Bxg7 Kxg7 20. g4 Nf6 21. Qh6+ Kg8 22. g5 Nh5 23. Rxh5 gxh5 24. g6.) 19. hxg6 hxg6 20. g4 a5 21. g5 Nxh5 22. Rxh5 gxh5 23. g6 e5 24. exf7+ Kf8 25. Be3 d5 26. exd5 Rxf7 27. d6 and White won shortly afterwards. ...the second reason is what Dr Lasker calls "the certainty of having to apply yourself vigorously".....in other words, "it's all very well for Nunn to do that, but if I tried it I would soon go wrong and then lose the endgame". Well, it's true that after sacrificing you have to play with a certain amount of vigour. But you have to do that anyway! If you want to stand up to really strong opponents. 1. Sacrificing against an opponent's position is a weapon in your armoury, just as much as a pawn storm. Learn to use it, or you simply blunt your own ability. 2. You cannot expect to see through "to the end", or even to a position of clear superiority. You must trust your positional judgement, which will tell you whether the positional advantages you gain outweigh the material disadvantage you incur. Position from Westphalen-Horton, Oxford and District League 1995. Play continued: 17. d4 Nxg2 (probably forced and possibly unsound) 18. Kxg2 exd4 19. Qg3 h4 20. Qd3 c5 21. Ng4 Bg5 22. Nf3 f5 On 22. f4 Black would still have played ...f5. He is playing logical attacking moves: it is White's more difficult task to work out their precise consequences. When the sacrifice was played, he had about 30 minutes left for 18 moves: after.... 23. exf5 Bb7 24. Rfe1 Qd5 ... he had 7 left for the last 11. He still should have done better than 25. Ne5? ?, but that's the sort of thing which happens in these positions, where one side has all the play and the consequences of everything are unclear. Black won. I think what players fear is that defence will be perfect, their attack will be inaccurate and therefore their material deficit will be decisive. But if you've already played better than the opponent, why should any such thing occur? My previous example was not, strictly speaking, the sort of play I'm referring to, since ultimately I had no choice but to sacrifice. But I had played for it from some moves before: it was the play, not a desperate contingency. One of those rare games where the winner feels he did everything right. Black won this game because he knew White had played inferior moves, and so instead of panicking when White threatened to win material on the Queenside, he rationalised "I must be better, so where can I win it? White is piling up on my right, so let's look at the Kingside. He's got nothing there at all. Attack!" If he'd worried about the loss of a pawn on the other side of the board, he would never have attacked the King - and he would probably have lost. I realise I've dealt entirely with sacrifices in connection with attacks on the King, rather than those for the initiative or a permanent positional advantage (pawn structure, opponents piece put out of play, etc). First things first. Next time you attack, be prepared to sacrifice. The alternative may be refusing to attack. How are you going to win playing like that? Chess player? Egghead? On TV? For a £1000? I have pretty exacting standards when it comes to TV. Does it have aliens? Does it have guns? If the answers are yes and yes, chances are I'll watch it. One yes and one no is a maybe. Two no's make a no-no. Still I might make an exception for the next series of Eggheads, a quiz that doesn't feature aliens or guns. Why? Because the production company is trying to recruit a team of chess players to take part in it. And what's more, those chess players could be you. Interested? Maybe in the prize of £1,000? Auditions are tomorrow, and then again in January. Details are here, or alternatively you can email Olivia Hamblin from the production company for more information (who adds in an aside that "one of our resident Eggheads is a big fan of chess.") Background on the show is also available via Wikipedia. 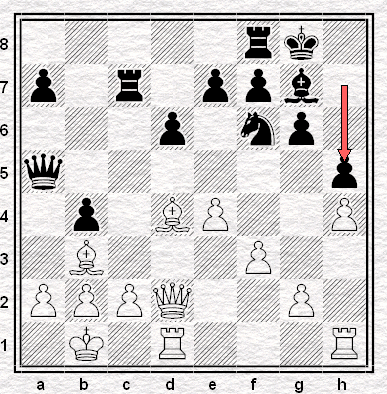 ...so I'll share with you this ending that appeared in Chess Today last Sunday. 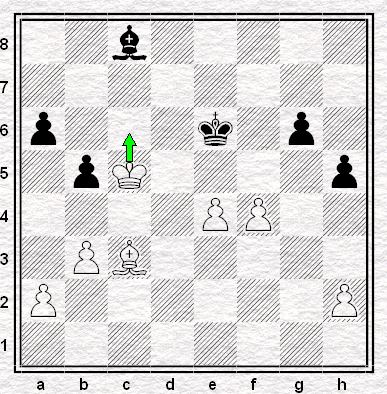 Rowe v Roussel-Roozmon, Jamaica v Canada, Dresden Olympiad 2008: position after 63...Ka4-b3. e. doesn't matter, they all lead to the same result? Sac, sac . . . fail!
. . . find annotated games from tournament books or magazines and play through them till you to come to the point with the greatest number of variations. Cover up the annotations with a sheet of paper and, without moving the pieces, just like a tournament game, analyse the position from 30 minutes to an hour. If the variations are extremely complex, you might write down your analyses while analysing. When time is out, stop analysing and uncover the annotations in the book or magazine, and compare your notes with the annotator’s. When starting out, there might be a great discrepancy between your analyses and the annotators’ but with time, one learns to delineate relevant moves and variations as this [method] will exercise and target the mind’s ability to perceive chess positions and produce high quality moves. Perhaps you recognize this position. It's a variation from the game Fischer-Larsen (Portoroz, 1958), which is game number 2 in Fischer's My 60 Memorable Games. In the game black didn't play 17... h7-h5 as indicated, but instead chose 17... Qb5. The longest note of Fischer's analysis concerns 17...h5 instead, which is why I chose this position for my exercise. Perhaps you'll want to try the same before reading on. Now, it may strike you that this position is rather thematic. Correct. As Fischer wrote, "I'd won dozens of skittles games in analogous positions and had it down to a science: pry open the h-file, sac, sac . . . mate!" Interesting concept of science aside, there is not much to add to that: white is obviously going to play g2-g4, try to line the heavy artillery up on the h-file (and maybe the g-file); the only remotely subtle point is that black's f-pawn is pinned, so g6 is undefended after 17... h5. Shouldn't be too hard, right? Especially if, like me, you'd played through this game and its notes about a week before on a bus to work? Except I failed to get anywhere, even missing, for instance, that after 18.g4 hxg4 19.h5 Nxh5 the simple 20.Bxg7 wins trivially. Have a go. Let us know how you got on, and what you think of this method. Oh, and most of Fischer's analysis of this game has also been posted to this chessgames page, if you want to see how it should be done. "Sac, sac . . . mate!" Your reporter Stephen Moss (death of a madman driven sane by chess, January 19) mentions that Bobby Fischer's mother was "an immensely strong-willed woman". in 1977, standing on the Grunwick picket line in north-west London, I recognised Regina Fischer and introduced myself. "Ah yes," she said, grimly, "you're the one who writes all those horrible things about Bobby." I explained that I would be delighted to learn that Bobby's alleged views on the inferiority of women, the evils of socialism and the duplicity of the Jews had been totally misrepresented, and I would be sure to get published whatever she told me. She considered this offer carefully. After some thought, she handed me a slice of the orange she was eating and said: "I forgive you". She added some words on the significance of vegetarianism and the meaningfulness of giving fruit. "But now," she said with absolute conviction, "I will stop this bus." For months, hundreds of pickets, including Arthur Scargill and the Yorkshire miners, had tried to stop the strike-breaking Grunwick bus from crossing the picket line, but without success, for massed police lines held back the pickets as the bus drove through the factory gates at speed. Some time later the bus appeared, as it did every day, cleaving its way through the enraged crowd. As it reached the gate, Regina threw herself in front of its wheels. Braking sharply, it ground to a halt. This was the only time during the historic Grunwick strike that the infamous bus was stopped by a demonstrator. Of course it would be marvelous if this was old turnip head himself but sadly I rather suspect it's not that Graham Taylor. Anyhoo, let us not bemoan the fact that failed national football managers are not more frequent correspondents of the Guardian and consider instead what can be found in the top left hand corner of page 84. Modesty forbids an outline here but suffice to say it constitutes the present the sole evidence for the present author's claim to be a published writer. Well that and the lingering feeling of resentment that my 'work' was butchered by an uncaring editor. The original was much funnier. Honest! "J Healy v T Duncan, Islington Club Championships - 1997. 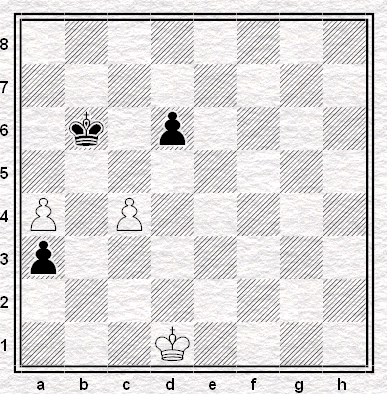 The black knight attacks two pawns, so the obvious drawing line for white is 1 BxKt, PXB when neither king has a route into the opposing position. 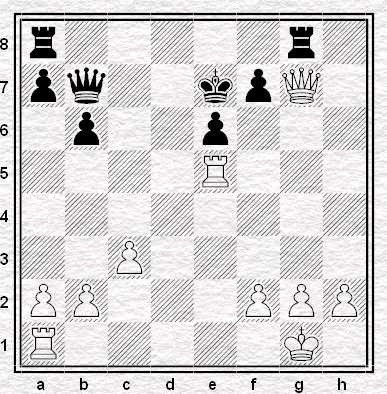 But instead white (to move) set a clever trap which snared black and won the game. Can you work out what happened? Winner John Healy is the author of two best-selling award-winning novels." (a) does anybody know anything of the "two best-selling award-winning novels" that Barden says Healy had published? I'm only aware of The Grass Arena but that was not a novel. "Back in England I never met the Countess again, nor did I play any more chess tournaments. Time clouding memory cured my longings for both." Today's puzzle is dated 1997. Is that a misprint or did John Healy come back to competitive chess at some point? This and that for your attention this Friday morning. We learn from the ECF that Bob Wade's funeral will take place on Tuesday next week (the 16th); 10.15am at Eltham Crematorium, Crown Woods Way, Eltham London SE9 2AZ, with a gathering to follow afterwards nearby at The Jolly Fenman, 64-68 Blackfen Road, Sidcup. All are welcome and more details are here, where there's also an email address to send condolences. I imagine more than a few of our readers will try to attend Bob's funeral to pay their respects. I've played two juniors these last couple of weeks - and each game they (with white) played a positional system based on d4 and a kingside fianchetto. Is it just a coincidence, or are kids nowadays trying to play like Kramnik? Certainly my approach to the opening two decades ago was very different: wait for your opponent to castle and go the other side; knights can only move forward, that kind of thing. Just like Kasparov, Tal, Morphy, I supposed, whom I somehow contrived to idolize as heroes of hacking. Which probably explains why said two juniors are commonly refered to as promising, a word never banded around while Chivers was in shorts. What would you do? My reasoning went as follows. 11... exd5 is clearly bad, and white threatens to play b4. 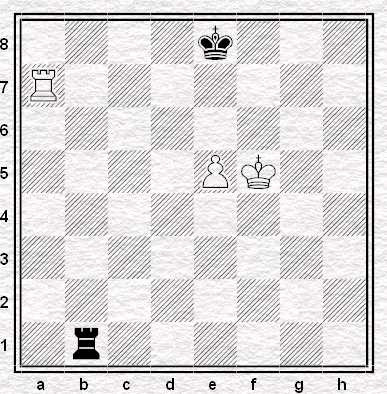 If I stop that with 11...b4 then 12.Bxb7 Nxb7 13.Nd5 (or even just 13.Na4) looks great for white. So I should protect the b7 bishop with my queen. How . . . ? Ah! 11...Qb6 looks like the best bet, because then the slight looseness of the knight on d4 might make it psychologically uncomfortable for white to play the immediately crushing 12.Bxf6 followed by 13.Qh5 (or some version thereof.) And guess what? It worked. My opponent instead played the slightly-less-than-immediately crushing 12.Bxf6 gxf6 13.b4 Nd7 14.Bxe6 and I eventually scrabbled to a draw. He said after that he'd intended Qh5 at some point but forgot about it. I'm pleased - but still, a very talented three year old could probably have done better than me, except they're all playing like Kramnik nowadays. TV fans who enjoy watching chess players stereotyped and insulted may, it seems, have an ideal opportunity tonight on the BBC via the Jack Dee comedy Lead Balloon - at least according to John Saunders at the English Chess Forum. That public-service inclusivity we've dared to dream of, at last? Finally, we've had nerd points, we've had Nostradamus points, we've had disco points, we've had couch potato points, and today we have Nice Person Points on offer for anyone who can think of a better name for these kinds of posts - the kind where the current writer witters on about whatever's been cluttering up his bricabrac of a consciousness of late. Surely you can beat 'Chiv Chat'? No points for 'Posts no-one reads to the end', which I hope I've just ruled out. There's always something good in New In Chess, partly because it's a good magazine, partly because there's always something in it about somebody I don't like. The latest issue arrived last week and I was gratified - if that be the right word - to find an item explaining that despite losing the world championship match, Vladimir Kramnik has in fact still got a world championship trophy in his possession, this being the Howard Staunton Memorial Trophy. A trophy that he won in 2000 - but only recently received. ...after the demise of Braingames he felt that they still owed him 14,000 pounds and he decided to keep the cup by way of compensation. This surprised me, since on reading that Ray still had the trophy I had assumed the only reasonable explanation was that it was too valuable, fragile and historically and culturally important to be allowed to leave the country, in much the same way as the Ashes never actually leave Lord's - a comparison I am almost equally surprised to find that Ray didn't think of himself. Perhaps he could use it in his Spectator column, assuming, as we regrettably must, that he is not likely to be sacked from it any time soon. 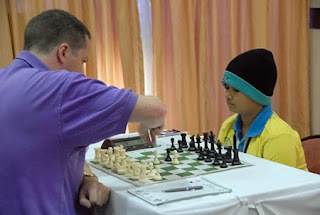 In the first round I faced one of the very youngest generation, 11-year-old Shardul Gagare. Winning was no trivial affair. Indeed I became so disconcerted by my opponent's mature play at one moment, and was moved to protest to the arbiter about my antagonist's woollen cap. ...worries about a possible hidden electronic device. The room, after all, was warm and the boy's hat covered his ears. The offending item of clothing was removed, and, as expected, it revealed nothing untoward. At about this point I started thinking that I'd read about the tournament already, and sure enough, on searching in Chessbase I found it: and I was chuffed to discover that it included a photo of the young lad, in play against Nigel, complete with his suspicious titfer. I'm surprised he's as old as eleven, to be honest: he looks young enough to have a teddy bear on his side of the board. God knows what Nigel would have done with that. Underneath the picture you can see the gamescore and a comment: "the game is interesting to replay". Actually it isn't or at very least, not unless we know the point at which Nigel decided to have the boy shaken down. Oddly, though, that aspect of the game isn't mentioned in the story. One wonders why. Presumably the Chessbase piece was written before the NiC article in which Nigel was perfectly happy to tell us all about it, so it's not as if he might have had a change of mind. I imagine the explanation is simply that Nigel just didn't think it worth mentioning to Fred Friedel when they talked, shortly after the tournament. Although it is, I suppose, also plausible that Friedel knew what Nigel had done - but decided it was better not to mention it, wondering, as Nigel probably does not, how having an eleven-year-old boy searched midgame for electronic devices would make him look. "Someone told me once during a recent tournament that he did not need to study the endgame because of his last twenty-two games only two had reached this stage. Later in the same tournament I saw him self-destruct in a position where he could have made it to a slightly worse endgame that offered drawing chances. I am sure that this is the usual pattern for him; he does not know the endgame very well and therefore he avoids endings at all costs. His reasoning comes afterwards." Last week I pondered the question Why Study the Endgame? The answer, according to our anonymous correspondent, is that 'It sorts out the Men from the Boys'. No doubt - but only if you actually get endgames when you play for real perhaps? I'd be interested to hear from regular tournament players as to whether or not Aagaard's story feels like a plausible explanation/justification for the apparent lack of affection for endgames amongst many amateur players. Even if it is, I wonder if it's different for those of us who are predominantly club players. I've played ten club games so far this season and if we leave out the one that's unfinished I average just 34 moves per contest. That figure includes one unusually lengthy encounter that lasted 71 moves. If we omit that one my average falls to below 30 moves per game. Not much chance of getting many endgames with figures like that. Even if my games are unusually short this year, and I think they are, looking back at last year's games I see a large number of them ending around the 30-40 move mark. Not coincidental, I'm sure, that my games tend to end at the arrival of the time control that marks the end of the initial session. It seems to me that for club players there's a huge structural disincentive to study the endgame. The practical problems of arranging a second session simply ensure games don't usually get played out so why bother to study a part of the game that you so rarely see for real. ... which I have to say was very satisfying. I can't remember the last time I played to bare kings. This game and the hour or two of adjournment analysis that went with it have definitely whetted my enthusiasm for playing (and studying) endgames. But how to get them? Can you ever get enough endgame experience playing only club chess? At the back of my mind I can hear Andrew Stone telling me that if you want to improve as a chess player you have to play tournaments. Perhaps the opportunities for endgame play, Jacob Aaagaard's anecdote not withstanding, is one of the reasons why. 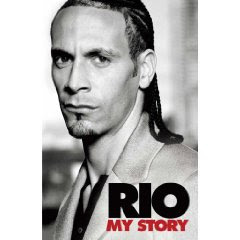 Does anybody remember the drugs test Rio Ferdinand forgot to take? It was a little over five years ago: on the 23rd of September 2003. He was asked to take a drugs test at Manchester United's training ground, left that venue without complying and as a result served an eight-month suspension from all professional football, beginning in January 2004 and extending past the European Championships in summer of that year. It was accepted that he had not avoided the test because he had anything to hide: if that had been suspected, the ban would almost certainly have been for two years and his professional career would have been in jeopardy. But it was clear that he had no reasonable excuse for missing the test and although neither Manchester United nor England were happy, there were plenty of people within the game who thought that Ferdinand was probably lucky to get away with the ban he received. You cannot refuse or otherwise avoid a drugs test: all professional sportspeople understand that, as do their teammates, trainers, managers, employers, advisers and agents. Rio Ferdinand understood that and failed to take the test anyway. Hence his ban. I was reminded of this episode when the kerfuffle occurred involving Vasily Ivanchuk's stupid and indefensible refusal to take a drugs test at the end of the Olympiad, for which refusal he has received a similarly indefensible amount of sympathy, some of it from people who should know better. Now, some issues in this whole affair need disentangling. It is not necessary, for instance, to agree with drugs testing in chess to think that Ivanchuk's failure to take a test is indefensible. I'm very much not in favour of drugs testing in chess: rather the contrary. While my drugs experiences (both in and outside chess) have been rather conservative and almost entirely restricted to alcohol, if any of my opponents wish, by way of contrast, to experiment with mescaline or psilocybe cubensis prior to or during a game I am very happy to encourage them to do so. All in the service of scientific endeavour, the pursuit of pleasure and my winning more games of chess, three causes which I think I can enthusiastically support. However, I'm also a strong supporter of the principle that sporting events should take place according to the rules and that no competitor is above them. None. Not Garry Kasparov, not Bobby Fischer, not Rio Ferdinand. None. They are obliged to play according to the rules under which they have agreed to play. They may disagree with them and say so. They may even on occasion choose to defy them openly, on a point of principle, and take the consequences. But they are not above them. They may not ignore them. They may not say, either overtly or in effect, "these rules do not apply to me, because of who I am". Now there are many players who get emotionally upset when they lose a game of chess in traumatic circumstances. 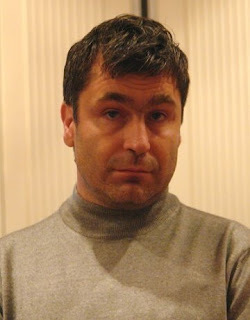 Vasily Ivanchuk, who is known to take his chess emotionally, is one, and the present writer is another: on those grounds I can sympathise with Ivanchuk and understand him. However, even if we take his emotional state into account (or accept Rio Ferdinand's defence that he forgot about his test) it's useful to remember that these people were not on their own. When Ferdinand was asked to take his test, there were Manchester United officials present: Ivanchuk was part of the Ukranian team. In either situation there were other people present whose responsibility it was to try and make sure that the test was taken. It's a failure not just of the individual (which is primarily the case) but also of the organisation who they were representing. Now the question is - do we really want chessplayers, or footballers, or athletes or cyclists or tennis players or golfers, to be able to ignore the rules when it suits them? Even if we do not personally agree with those rules, even if we understand that people have emotional reactions which cause them to behave irrationally or forgetfully, even if we dislike the authority which has the responsibility to enforce them? Andybody who cheers on Ivanchuk has to ask whether they really want the biggest players to be bigger than the game itself. Is that really where you want chess to go? Have you really thought about what happens if it does? Is that a box you really want to open? But of course that box is probably open already, if we are to be honest about it. It is highly unlikely that FIDE have the clout to back up any decision they take, unless that decision is to accept Ivanchuk's excuses and decide to impose no penalty (save perhaps a modest fine). The reason is that they know that if it comes down to it, leading tournaments are likely to prefer to invite Ivanchuk to play and call FIDE's bluff. And I think it would be a bluff - whereas I cannot imagine a cycle race or tennis tournament accepting a player who was serving a ban. Which to my mind, tells us something else. There is a lot of complaining from leading grandmasters about their lot in chess. The truth is that they have fewer obligations and more influence than their contemporaries in almost any other sport that I can think of. Almost no other leading sportspeople can, for instance, pick and choose the events they play in to quite the extent that one can in chess: not in tennis, not in motor racing, not in golf. I can only think of boxing, among genuinely worldwide sports, that can compare, and boxing is not an example any helthy sport should seek to imitiate. By and large, in chess, it's the top players who have the clout. To some extent that's a good thing - but it's not entirely a good thing, especially not if it makes them bigger than the rules. And their constant tiresome complaining that the truth is otherwise - that's not a good thing at all. What happened in football in 2003? The richest football club in the world and their record transfer were shown not to be bigger than the sport and its rules. That's a good example for chess. It's an example chess should be able to follow. I doubt we will. I doubt we can. It's no secret that in the Londons League's Division One, matches are played across twelve boards. So it may surprise some to see board 9 from our match versus Athenaeum on the 26th November being declared void, the final score given out of eleven. That is until you notice the date. The match was played on the same day that Bob Wade was taken into hospital, subsequently passing away on the Saturday. On that Wednesday he was due to play board 9 against us, but our team decided afterwards that -in captain Martin Smith's words- due to "the fondness and admiration that we all held for Bob, transcending team and club interests, and as mark of respect to his memory" we did not want to claim that particular win. A tie then the match turns out: but a result we hope that offers a small, affectionate gesture towards one of Caissa's most warmly-regarded servants, and all our condolences. May he rest in peace. Perhaps other club news might now strike a somewhat minor note, but nonetheless on our great game goes being played. Streatham Two for instance are 3-2 down in their match against Cavendish Thirds from the 4th, with a remarkable five games adjourned. Good luck to the team with those. Meanwhile on the subject of adjourned results, Streatham's Third Team London League match against West London 2 from two weeks ago today was left 4-2 on the night itself, with two left to play. The two left to play were both rook endgames - with fellow bloggers Morgan and Jonathan B commanding the pieces - and inevitably they ended in draws. So we win that one 5-3. Finally, in the Croydon League's Division One, our first team beat Crystal Palace on the 24th by the score of 3-1. Now if that score sounds like a familiar result to you in this competition, you're not wrong. As Neill Cooper has emailed me to point out, the remarkable fact is that every match so far in the Division has been decided by that same score. What are the odds? And that's it for now, until next time. "J Healy v R Elwell, coffee house game, London 1980. 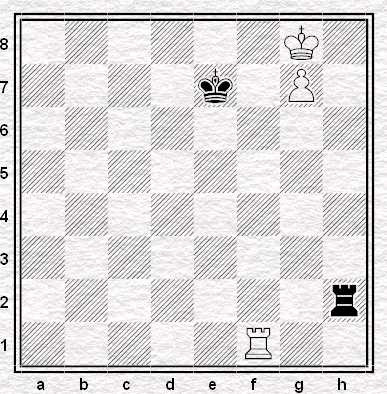 White (to move) is a pawn down so would like to advance his rook pawn to queen. 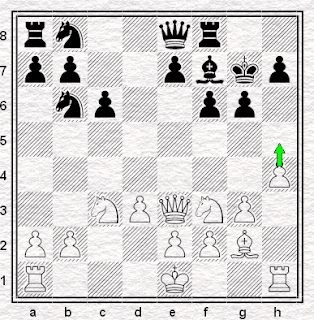 Black, however, is ready to stop the pawn in the nick of time by R-KR1 and R-QR1. What should white play?" Following on from last Saturday, here's another John Healy chess problem via Leonard Barden via thegrassarena.net. When I think of FIDE, as I often do, I sometimes find myself thinking about Motherwell. but if my memory serves me adequately, that isn't the whole explanation. As the rules stood at the start of season, Motherwell and Clydebank should have gone down: but they were changed either in mid-season or at the season's end, reprieving clubs who would otherwise have been demoted. Now I personally have no interest in either Motherwell or Falkirk, having never been to either place, but before and since those mid-season rule changes, the Motherwell Manouevre has seemed to me the very essence of What Should Not Happen. You don't change the rules in mid-game: or in mid-season. You play to the rules, and if there's something wrong you change them for the next time. You can take it as read, then, that I disapprove of the proposals to change the World Championship qualification procedure in mistream, as is currently proposed by FIDE and opposed by pretty much everybody else. I don't like it, I don't agree with it and I think it hurts the credibility of the cycle. It is, as I say, the very essence of What Should Not Happen. What I am not, however, is fool enough to think that this is only happening through the incompetence or corruption or stupidity (or any combination of these qualities) of FIDE. It is happening because in the prevailing circumstances it is likely to happen, and the reason it is likely to happen is that many of the leading players do not want to be tied to a long world championship cycle. In all probability, given the the world championship match is by far the most prestigious (and hence lucrative) of the matches involved, it is not really worth their while unless they win through to that final. So they would prefer to make themselves available for better offers: for one-off tournaments offering big prizes and appearance fees. This is the reality of modern-day elite chess. The players want to be able to pick and choose, and have a perfect right to do so. However, that is simply not incompatible with a strong and inclusive world championship cycle. You can have powerful, independent players, or you can have a proper world championship cycle in which all the best players are induced to play. Outside people's imaginations, it is hard to see how the two can co-exist. So the players do not want to commit themselves, and the the cycle does not include all the best ones, and then there is less interest from sponsors and less money, and so it is less attractive, and so on. Hence, the thrashing around and the appearance of the Motherwell Manoeuvre. It exists not because of the awfulness or otherwise of FIDE, but because there is a real problem. Most commentary on the question - and indeed on FIDE matters generally - doesn't recognise this. There is no recognition whatsoever that the demands and interests of the players themselves might contribute to the problem. There are a number of reasons why, but these would include the desire to keep all the top players sweet so that they keep on writing for you (New in Chess) or a desire not to alienate potential supporters in the cause of maintaining a political opposition to FIDE (Chessbase). I enjoy both New in Chess and Chessbase, but both are publications with interests and agendas. I don't mind that, but I do mind it going unmentioned, and chess politics being discussed in Manichean terms, as if there were only wicked, nasty FIDE with their friends and favoured players on the one side, and then everybody else on the other. It doesn't help. Although it may help some people. I don't hold any cards for prominent figures in FIDE (which is as corrupt and autocratic an organisation as a number of other sporting bodies I can think of) but I am sceptical of the idea that a world championship cycle would be any better, or any less subject to changes of rule midstream, if it were run by anybody else. Lectures from Chessbase on the subject of favouritism tend to sit uncomfortably with their its role as a publicity outlet for the personal and political friends of Fred Friedel: nor does one's memory of Gary Kasparov's ownership of the PCA world title lead one to have any confidence in a likely repetition. Unless my memory is so bad that Kramnik didn't lose to Shirov and then play Kasparov nonetheless. A world championship cycle is costly to run and time-consuming to play in. It may very well be that in this day and age, it can't be sustained in the way it was when FIDE was more powerful than the players and when most of those players were from the USSR and did what they were told. That's OK, the world changes and sport changes with it. But make no mistake, the alternative to a world championship organised by FIDE is likely to be a chaotic squabble with different leading players, their sponsors and managers all shouting foul at one another. If you don't like the Motherwell Manoeuvre, you may see a lot more of it in the future. Because that is what used to happen, in the past. 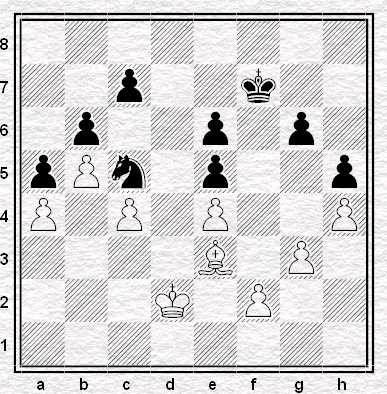 Horton - Faro Perella, Huesca Individual Championship 2008, the game from yesterday's posting - the position in the photo was that after White's ninth move in the game given below. 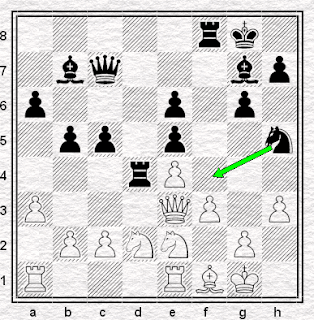 The position in the diagram, however, is that arising after 42...Bd7-c8. 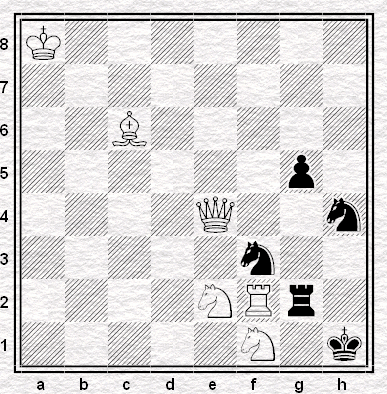 White, who had managed to make something out of a very drawn ending indeed, proceeded to play 43.Kc6 and press his clock, at which point we became aware that Black's clock was showing -0:00 thus indicating that Black had lost on time before making his last move. Black was not entirely pleased about this, being of the opinion that he'd made his move before his time had run out and that the clock must somehow be faulty. I wasn't in a position to support or contradict him, not having been looking at his clock at the time. 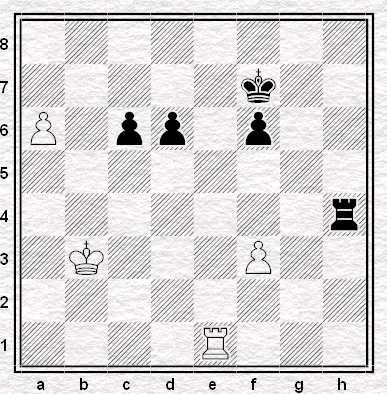 Anyway, at the time I didn't think it made much of a difference: Kc6 wins a second pawn and seeing that one of those pawns was passed, with a second one surely coming on the queenside soon, I thought the position resignable, but to my surprise Black thought otherwise and a postmortem sequence swiftly followed: 43... Bd7 44.Kb7 b4!? 45.Bxb4 Bb5 protecting the pawn I'd been expecting to win, albeit at the cost of jettisoning another. The activated bishop proceeded to make problems for my queenside pawns every time I tried to advance them. 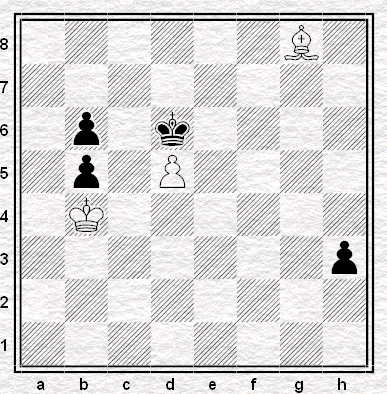 Moreover, Rybka found another way to make life a little difficult for White, with - in place of 44...b4!? 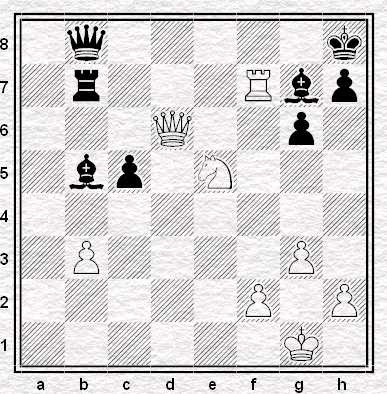 above - 44...Kd6 and if 45.Kxa6 Kc5 trying to edge White's king out of the game. Now, as it goes I still think the ending should be easily enough won for White. Rybka's plan can be combatted with 45.Bb4+ or the - simply 46.Bc3 is good enough, giving up the passed pawn after 46...Bd3 47.b4 (or even 47.a4 and if 47...Bxe4 48.Kxa6. Still, it's funny how hard it can be to prove a won ending won in a post-mortem (I didn't) let alone at the board when you have thirty seconds a move and your opponent doesn't feel like resigning early today. What's odd, though, is that I played the same opponent in the same competition last year, albeit with colours reversed. (Or this year was with coloured reversed, since I suppose you cannot reverse the colours until you have had them once already.) And as it happens, on that occasion too I was two pawns up, with opposite-coloured bishops on the board, in an ending I thought my opponent might well resign and he thought he might well draw. Doubles: doubles, but opposites. I'm not sure if that's what Kavalek meant. My photo was in the local paper last week, you'll be thrilled to know. Still, it does serve the purpose of illustrating that chess news gets more coverage in a local paper in a rural part of Spain than it does in any English metropolitan newspaper I can think of. Click on the photo for a larger image, if you really think it's worth it. As you can see it's Black to play in a fairly placid and uncomplicated position (you'd probably guess I was playing even if you didn't know already). 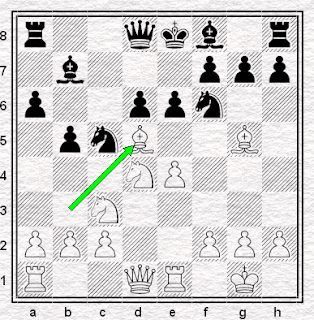 The question then is a simple one: reconstruct the move order that led to the featured position. The closest wins. They don't win anything though, they just win. White to play. What result? 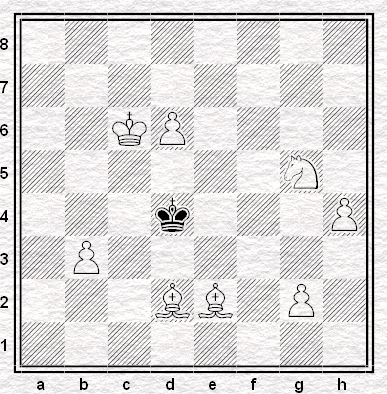 Today's title and puzzle, the latter in slightly modified form, can be found in Aagaard's Excelling at Chess. I'll be getting back to why I found them particularly interesting next week. Once upon a time, London was the envy of the Western chess world. Her clubs were bursting with fresh opening ideas and future Grandmasters; her leagues, blessed with illustrious names traveling in to play top board and teach us all a lesson. Streatham and Brixton Chess Club has its own surplus of proud boasts from those glory days. The names of GMs Julian Hodgson and Glenn Flear adorn our club trophy, but the list of our famous ex-members hardly stops there. And today we take you back to the late 1960s when a certain Raymond Keene - not yet Grandmaster, not yet prolific writer, not yet elite organizer, not yet OBE - was Streatham & Brixton Chess Club's very own board one. And what a board one he was. Still in his teens and studying at college, over three consecutive seasons in the 1960s Ray tells me that he scored +13 =5 -1 for us under the captaincy of Richard Boxall, an entirely enviable record that includes 1½/2 against ten-times British Champion Jonathan Penrose. 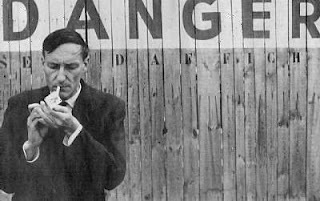 And very kindly, Ray has also sent us his victory over Penrose to share with readers of the blog, permitting us to reproduce his annotations as well. I'm sure I'm not the only one who'd like to thank Ray ever so for that special treat. And indeed if you wish to do so yourself, Ray can be easily contacted via his Chessgames page, the site where his annotations featured above also previously appeared. Or if you'd like to find out more about Ray, his home page is here. Will our club ever see such a board one again? There really is only one Raymond Keene, so the answer has to be no - unless Ray comes out of London League retirement, that is. You never know!